HOUSTON — Rescuers answered thousands of calls from people trapped in Houston on Sunday as torrential rain from deadly Hurricane Harvey caused "catastrophic flooding" in the city and across southeast Texas, officials said. "This event is unprecedented & all impacts are unknown & beyond anything experienced," the National Weather Service said Sunday morning. At least one person has died in flooding in Houston, officials said. The storm is blamed in at least two deaths overall. Houston police said Sunday afternoon that more than 1,200 people had been rescued, with more to come. The weather service warned that flooding victims should go to their rooftops and not their attics to avoid being trapped by the rushing waters. Police in the city of Dickinson, southeast of Houston, made an online plea for people with boats to help in rescues. "This is a life-threatening situation," said Michael Palmer, lead meteorologist at The Weather Channel. In parts of south Houston, there were multiple abandoned cars and manhole covers spewed rushing water. As the rain slowed Sunday afternoon, one car blocked a roadway where it had stalled when the flood waters were high. 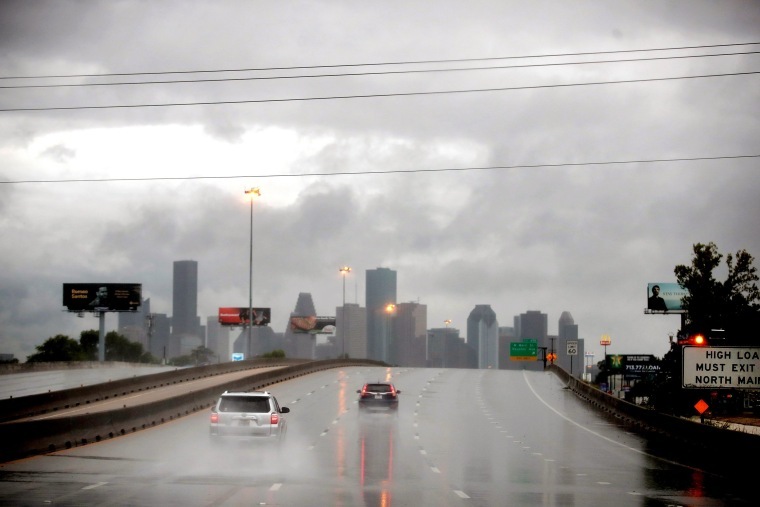 Some parts of Houston and just west of the city could receive a Texas record of 50 inches of rain as the tropical storm continues to stall over the area, NWS meteorologist Patrick Burke told the Associated Press. The NWS said local rainfall of 50 inches "would exceed any previous Texas rainfall record." "The breadth and intensity of this rainfall are beyond anything experienced before," the agency's Weather Prediction Center said in a tweet. Earlier Sunday, the National Weather Service said that the Houston and Galveston area had received 24.10 inches of rain in the last 24 hours. The average rain fall within the Harris County emergency management network had already exceeded that of Tropical Storm Allison in 2001 in almost half the time, the Weather Prediction Center said. The National Hurricane Center said that Allison caused 41 deaths, with 23 in the state of Texas alone, and an estimated $5 billion in damages. President Donald Trump will be traveling to Texas on Tuesday after coordinating with state and local officials, said White House Press Secretary Sarah Huckabee Sanders. "We continue to keep all of those affected in our thoughts and prayers," she said. Texas Gov. Greg Abbott said Sunday afternoon that 3,000 national and state Guard personnel have been activated in the state. "One thing that we are dealing with here is basically a triangle of ongoing rain that stretches one tip of which would be the Corpus Christi area, up to Travis county, over to Chamber's county and then back to Corpus Christi," he said during a news conference. "Parts of those regions will continue to receive incredibly heavy rain that will lead to even more flooding and more danger for Texans." Abbott stressed "the importance of staying off the road" during the heavy rains and urged people to avoid going outside if possible. "If you drive in the water, you're taking your life in your own hands," he said. University of Houston students Kevin Ford and Jimmy Taravella, both 20, surveyed the flooding outside the college's fraternity housing on Sunday afternoon and said the storm was worse than they imagined. "This is the first time I’m seeing it and it’s pretty bad," said Ford. Ford said university officials said some fraternity and sorority buildings had to be evacuated. Some students had to leave behind cars that were stuck in water several feet deep and as high as their engines. In several low-lying areas on campus, multiple vehicles were engulfed in water. There was a heavy police presence in the city on Sunday as officials continued to rescue people from the heavy flooding. At the university, campus police continuously patrolled the area, encouraging curious students to head back inland. As responders rushed to save people from flooded homes and stranded cars, Houston city officials said emergency services were "at capacity" and warned residents to "shelter in place" and not to call 911 unless they were in "imminent danger." "We have had an unprecedented amount of water," Turner said. "I don’t think I need to tell anyone at this point that this is a very, very serious and unprecedented storm," he said. "The safest place is for you to be in your home," he said. "Currently there are five MH-65 Dolphin Helicopters conducting rescues," the statement said. The flooding came as emergency services along the Gulf Coast scrambled to reach those in need of assistance, and many in the path of the storm began to assess the devastation. Brock Long, administrator of the Federal Emergency Management Agency (FEMA), said on NBC News' "Meet The Press" Sunday morning that the recovery effort would take "years." Long told host Chuck Todd that President Donald Trump was "extremely concerned" about the situation on the ground. "He’s given me all the authorities to amass the resources from the federal government down through our state and local partners," he said adding, "right now we have nearly 5,000 staff that we have coordinated across the federal government within the states of Texas and Louisiana." The storm was about 15 miles northeast of Victoria as of 8 p.m. ET Sunday with 40-mph winds, and it is causing "unprecedented flooding," the National Hurricane Center said. "When you get rates of over six inches of rainfall an hour it overflows the drainage systems and homes and businesses will be flooded, which is what we're seeing now in Houston," Palmer said. He warned that the storm was likely to stay in the same area for the next few days meaning rainfall would continue to fall over southeast Texas. "The flooding is only going to get worse as we go forward," he said. Current forecasts see total rainfall between Sunday and Thursday reaching 40-50 inches, which "would be one of the worst floods in U.S. history," Palmer said. More than 80,000 people were without power in the Houston area, CenterPoint Energy said. City officials warned residents to stay at home as rescue operations were carried out. "There are a number of people on our streets calling 911 exhausting needed resources. You can help by staying off the streets," said Turner, Houston's mayor. Houston Police Chief Art Acevedo posted a warning on Twitter, saying: "Cannot emphasize enough how much flooding there is on roadways you are endangering yourself and our first responders by being out stay put ... do not think it's safe to be driving anywhere in the city." He added: "Have reports of people getting into attic to escape floodwater do not to do so unless you have an axe or means to break through onto your roof." Houston’s William P. Hobby Airport and Houston Bush Airport said all commercial flights are canceled until further notice. Trump said on Twitter Sunday: "Many people are now saying that this is the worst storm/hurricane they have ever seen. Good news is we have great talent on the ground." Phil McCausland reported from Houston, Daniella Silva reported from New York and Saphora Smith reported from London.